On National Dog Day, everyone knows the only thing better than one dog featured for adoption is two dogs. Such is the case Sunday when we spotlight 9-year-old Patches and her 6-year-old son, Titus. The two American bulldog mix breeds are being cared for by the folks with Bailey's Way Rescue. 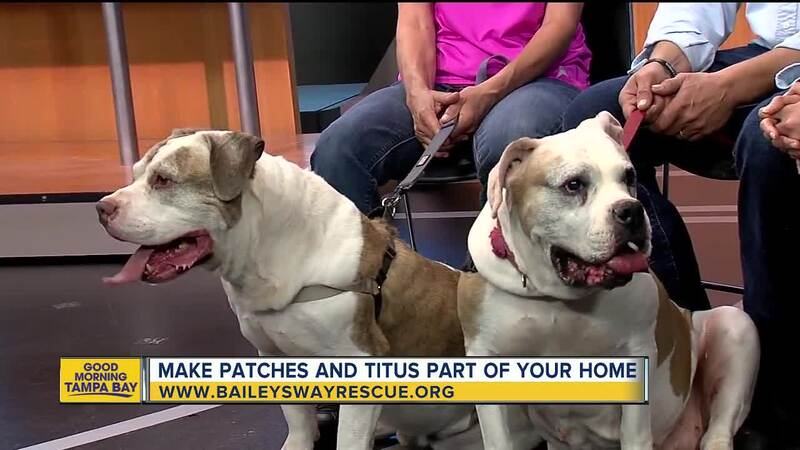 Patches and Titus have always been together, so it is the desire of the rescue group to keep them together. Like many mother-offspring relationships, the duo, covered in white fur with tan spots, rely on one another for reassurance, confidence and companionship. They were taken in by Bailey's Way Rescue in December when the family that originally had the pair was unable to care for them any longer. Patches and Titus are couch potatoes at heart, but enjoy playing whenever you're ready. They would be perfect for a family with no pets and older children. When Bailey's Way Rescue inherited the duo in December, it was determined Patches had Pyometra, a condition that caused her uterus to rupture. Patches has completely recovered from surgery. She has been spayed; Titus was neutered. They are fully vaccinated and microchipped. For more information about Patches and Titus or to complete an adoption application, go online to www.baileyswayrescue.org.